At 97 years old, Charles Leuzzi obtained his high school diploma. Charles Leuzzi surrounded by family and friends as he recieved his diploma. South Philly native Charles Leuzzi always wanted to graduate high school, despite having to leave right before his junior year to help support his family financially. 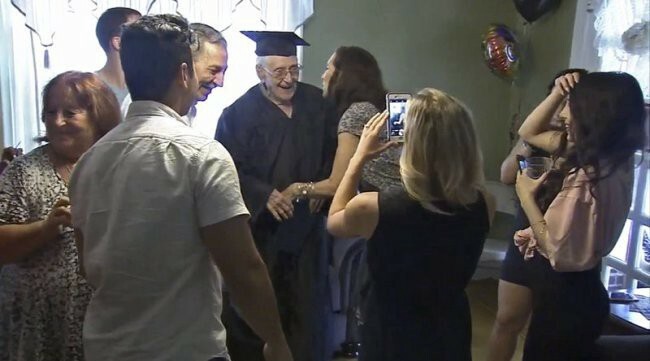 Yet, proving it’s never too late to work on advancing one’s education, the now 97-year-old received his honorary high school diploma from South Philadelphia High School on Sunday, July 16. Born on Jan. 14, 1920, to Italian immigrants, Leuzzi’s parents had hoped that by relocating to America their son would have increased opportunity, and would be able to learn to both read and write. Fulfilling their wishes, he grew up on the 700 block of Tree Street and attended Francis Scott Key Elementary School and eventually began attending South Philadelphia High School. Yet, amid the onset of the Great Depression, Leuzzi was forced to remove himself from his studies and begin working to help pull his family out of poverty. In doing so, he obtained a job at the Wricley Nut Company, a small, family-owned business located at 480 Pattison Ave.
“My father frequently stops by the factory to reminisce with the present owner, the grandson of his first employer, who loves hearing stories about his family,” Beverly Pintarelli, his second of three daughters, said. 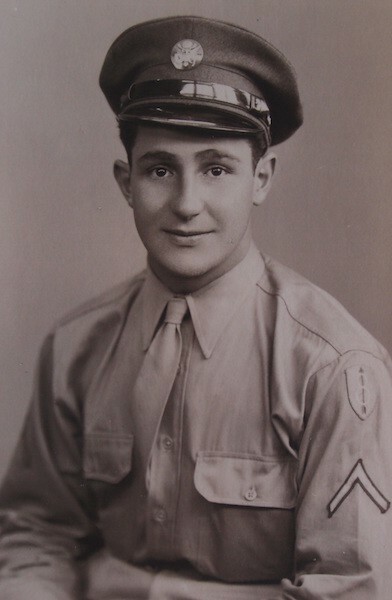 Years later in 1942, Leuzzi was drafted into the U.S. Army 8th Division, 13th Infantry, Company D, during World War II as a sergeant. Upon finishing boot camp, he was shipped from Fort Dix on a transport boat headed for Ireland, and from there, he landed on Omaha Beach just 28 days after the D-Day invasion. Fighting on the front lines across France, Leuzzi was a member of the troops who followed Gen. Patton’s tanks as they headed toward Germany, ultimately finding himself in the Battle of Huertgen Forest. As the Allies suffered great losses, Leuzzi was wounded on April 1, 1945, and was honorably discharged in November of that year. However, before his discharge, Leuzzi was awarded two Purple Hearts and four Bronze Star medals for his heroism and dedication to serving his country. In resuming life as a civilian, Leuzzi married Narue Salice four years later on June 4, 1949, at B.V.M. Church, and once again began working at the Wricley Nut Company. Not long after marrying Salice, Leuzzi found himself with three young daughters and an increased need for money. Therefore, he found an alternative job as a shipper at After Six Formal Wear, where he remained for 40 years until retirement in 1994. Once retired, he took to the activities he loves, including golfing nine holes at Franklin Delano Roosevelt Park whenever the weather permits. Yet, despite leading a happy and full life, Leuzzi’s only regret was having not fulfilled his parents’ wish that he someday obtain his high school diploma. In helping her father achieve his goals, Pintarelli sent a letter to South Philly High after passing by the school a few weeks ago, sharing all of her father’s achievements and asking he receive his diploma. In response, the school asked for documentation of his military service and awards, and found his records from when he attended the school. Thus, the school agreed to award him his diploma, and Leuzzi even received a letter of congratulations from Sen. Bob Casey Jr. In the letter, Casey noted that Leuzzi’s accomplishment illustrates his commitment to excellence in all of his endeavors, as well as his hard work, commitment and leadership. In addition, Casey commended him for his lifelong service, Purple Hearts, Bronze Stars and care of his children and grandchildren.